Eniva Minerals for Life® Copper Liquid Concentrate is a dietary supplement of the Cell-Ready® essential trace mineral COPPER in a proprietary nutrient delivery system. Copper (symbol "Cu") occurs naturally in the earth as a pure metal, in various rock minerals, as well as seawater. It is a trace mineral essential to plants, animals and man. It is a cofactor in several important enzyme systems in the body, including superoxide dismutase (S.O.D.). Other Ingredients: Purified water, copper (from copper sulfate). Directions: Adults: 1 Teaspoon daily. 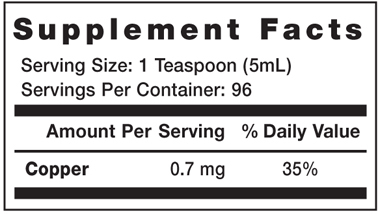 Do not exceed 6 Teaspoons daily. Storage Directions: Avoid freezing and heat. Caution: Do not consume if tamper resistant seal is broken/missing. Do not consume if allergic to components found within product. As with all dietary supplements, contact your doctor before use. If taking prescription medications, have an ongoing medical condition, are pregnant, nursing or under age 18, consult doctor before use. Isolated vitamins or nutrients are best taken as part of a well balanced diet and broad supplement program. KEEP CAP TIGHTLY CLOSED. KEEP OUT OF REACH OF CHILDREN.